Marley and Tula are lovely chocolate brown Labs, and as with most labs they love to forage whilst out on walks. Marley is 9 years old while Tula is smaller and just over a year old. On Tuesday they were out being walked by Chloe in Stanford Le Hope and were off rummaging about as they often do. After their walk they come home and the family sat down for dinner. Shortly afterwards they noticed Tula was acting strangely. She started nodding her head, knocked over the water bowl stand and then slumped and collapsed. She was rushed in to see us at Cherrydown and our duty vet Josh examined her. She was fitting, barely able to stand, her pupils were dilating and constricting independently and she appeared to be under the influence of a toxic substance. She was admitted into the hospital and put on to fluids while we did blood tests. The family went home and by the time they got there Marley was displaying similar symptoms so was brought in to Cherrydown as well. As her symptoms weren’t as bad Josh was able to make her sick to try to reduce the absorption of toxicity. Both dogs were put onto fluids, closely monitored and symptomatic treatment given. A search was conducted of the area where the dogs had been foraging and a black bin liner was found with rotted down cannabis plants. This was disposed of so no other animals could be affected and the information put onto the Stanford-Le-Hope Facebook page. We do occasionally see dogs that have been affected by cannabis. The most common signs that a pet has ingested cannabis are depression and listlessness, loss of motor coordination including loss of balance, vomiting and hypothermia. The eyes may dilate and constrict (sometimes independently) and they may suffer thirst and loss of appetite. In addition the heart can be affected so it either slows (bradycardia) or races (tachycardia), the animal may be agitated, suffer diarrhea, vomitting, urinary incontinence and seizures. In very severe cases it can lead to coma and death. The effects of cannabis do not occur immediately after ingestion but usually come on an hour or two afterwards. The effects can last 12 to 24 hours but getting the correct treatment as soon as possible will speed the recovery and the pet can be made safe and comfortable. If you are aware your pet has ingested cannabis or displays any of the above signs then you need to get your pet to the vet as quickly as possible. Be honest with your vet and tell them if you know your vet has ingested cannabis so they can give the best possible treatment. Getting your pet well again is all that really matters to them and you can guarantee it’s probably not the first case the vet will have seen. 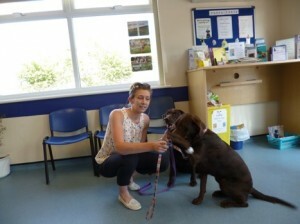 Tula and Marley have both recovered well enough to go home and they will be monitored for any further signs of illness.